Midwife and coach Diana Koster (The Netherlands, 1965 – 2016) was a specialist in helping women cope with the trauma of childbirth. In The Myth of Perfection in Childbirth she gives a voice to women who suffer from this trauma. For some women, the psychological toll of childbirth leads to a form of PTSD—distinct from postpartum depression—that follows them into new motherhood. The traumatic experience can come before or during pregnancy, like a bad reaction to fertility treatment or severe morning sickness. Other times, it can come during labor and delivery: When a newborn has a medical problem, or when a woman feels coerced into undergoing invasive procedures during the birthing process. An experience that may not seem to be a big deal to some women and outsiders, can be experienced as traumatic to her. 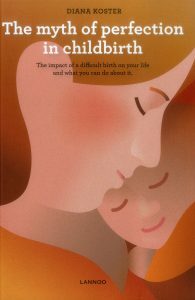 This book explains how a birth trauma can affect you, your relationship with your baby and the relationship with your partner. With the help of practical exercises and honest accounts from women who have overcome birth trauma themselves, you will learn to process this experience and restore your inner balance. The Myth of perfection in childbirth is described as “The first and taboo-breaking book on negative birthing experience,” this book will provide a pillar for many women, who have been suffering in silence for too long. Koster shows how a negative birthing experience can affect women, she offers support for those directly affected and she provides assistance for care professionals seeking to learn more about birth trauma. “I wish this book had existed four years ago. My friends and family seemed to be pushing the joy of motherhood down my throat while, to me, the delivery felt more like a landslide. Thanks to Diana’s coaching, I became the old Maria again.” Maria, mum of two daughters.